Here, in a unique collaboration with Timothy Samuelson, Chicago’s leading architectural historian, Vergara probes the power and resonance of one of America’s greatest cities. Unexpected Chicagoland includes over two hundred stunning color photographs, accompanied by a fascinating original narrative of the hidden history of Chicago’s renowned architectural past. Vergara’s photographs are a treasure trove of historically and visually interesting buildings and environments, most of them on the abandoned urban fringes. Included are examples of rarely seen work by some of the greatest architects of the twentieth century, such as Louis Sullivan, Frank Lloyd Wright, and William Burley Griffin, as well as dazzling examples of Art Deco design. Unexpected Chicagoland presents an authentic and gritty view of the metropolis at a time when the public’s understanding of all American cities has become increasingly sanitized and homogenized. The book itself, in a large format and exquisitely designed, is packaged to be a lasting visual treasure. 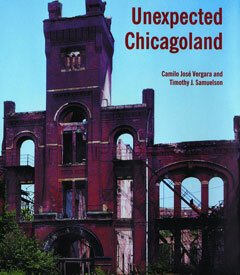 Timothy Samuelson is a cultural historian at the Chicago Cultural Center and the author of Above Chicago and, with Camilo José Vergara, Unexpected Chicagoland (The New Press).